On October 31, 1991, a low pressure system, high pressure system, and fading hurricane collided over the Atlantic Ocean, creating what became known as The Perfect Storm. Originally called the Halloween Storm or No-Name Hurricane, this tempest slammed the eastern United States, causing hundreds of millions of dollars in damage. 10 people tragically lost their lives due to the storm. The Perfect Storm rivaled the devastating Blizzard of '78 in terms of storm surge and flooding. About 100 homes along the Massachusetts coast were completely destroyed by The Perfect Storm. Seven counties in Massachusetts were declared Federal Disaster Areas. High tide was about four feet greater than normal, and 25-foot waves were observed. Six men aboard the Gloucester fishing vessel Andrea Gail, later made famous by the book and film, tragically lost their lives. South of Long Island, a rescue helicopter was forced to ditch into the sea, and a New York Air National Guardsman also lost his life. In greater Boston, most of the damage was caused by wind-driven rain. High winds made small debris airborne, damaged rooftops and wooden structures, knocked signs over, and flooded low lying areas. This author went to Revere Beach, just north of Boston, on the evening of November 2nd or 3rd, 1991. Everything at the bottom of Revere Bay was thrown up onto the beach. Dozens of lobster traps, tons of seaweed, and a great deal of ancient boat debris was thrown about the shore. Revere Beach rests on a large tidal flat, and most of the sand was blown completely off the beach and into the adjacent streets. 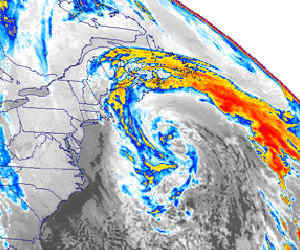 The Perfect Storm was a classic Nor'easter, when a hurricane-like system forms off the New England coast, swirling from the north and east. Bob Case, a NOAA forecaster is credited with naming the storm, having made the statement when fading Hurricane Grace was about to add huge tropical energy to the colliding low and high pressure systems. Local weather forecasters, including Todd Gross and others, quickly acted to warn people about the dangerous weather system, saving many lives.